The book is told in first-person from the Inquisitor Gregor Eisenhorn’s perspective, and many times feels a bit like a memoir as he breaks the fourth wall (if such a concept can exist in books) to address the reader directly. Overall, I think I liked the style of this narrative, though there were times when I thought it was a bit weird – I think there were a couple of instances where plot twists were described that Eisenhorn clearly knew of the twist, but the first-person narrative came across like he didn’t. I’ve not read that many novels with unreliable narrators, but still, it somehow didn’t really do it for me, if I’m honest. The plot of the book is fairly wide-ranging, its breadth being fairly shocking if I’m honest! It starts with Eisenhorn hunting a Chaos cult-leader as he engineers some nefarious scheme, but the subsequent investigation takes him on a planet-hopping journey on the tail of more cultists of Slaanesh, and even a couple of Emperor’s Children marines! There were odd moments where the plot felt a bit, not rushed per se, but it certainly flew by in a manner I wasn’t quite expecting. Along the way, we get to see some of the inner workings of the Inquisition, but in the main this is more of an action novel as we see Eisenhorn on the trail of the Chaos cultists, who are trying to recover a powerful artifact called the Necroteuch, a book serves more as a plot device than anything else. The cultists are carrying out some archaeological research, recovering artifacts of the saruthi xenos race, in order for them to trade for the book. When Eisenhorn thwarts their attempts, the Inquisition believes the matter is over, but Eisenhorn soon discovers that the cultists are attempting to recover a copy, so the Ordo Xenos unites to prevent them, along with a full kill team of Deathwatch marines. They eventually do so, uncovering a traitor in their midst and finally eliminating the last of the cultists. 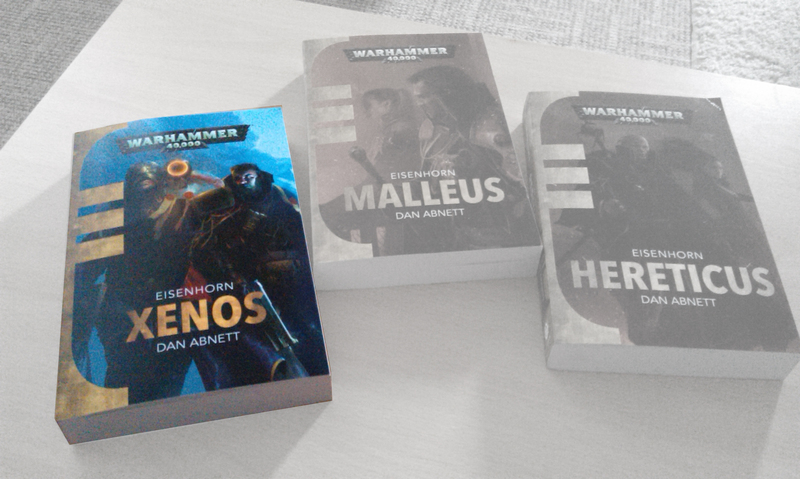 It’s a good book, don’t get me wrong, it’s just no Horus Rising, which I think I expect almost every Warhammer 40k novel to be these days! The story of an Imperial person going after Chaos cultists who are somehow involved with xenos artifacts is something of an old one, I feel, but it’s still worth a read. The fact that it’s first-person meant I got through it fairly quickly, too, which is a bonus! As I stated in the last novel review blog I did, I’m reading this trilogy and the Powder Mage trilogy interspersed, so it’s on to The Crimson Campaign next, then I’ll return to Malleus soon!